#205: Verser Reunion | mark Joseph "young"
This is mark Joseph “young” blog entry #205, on the subject of Verser Reunion. #202: Verser Confrontations (chapters 100 through 110). This picks up from there, with chapters 111 through 121. I’d been trying to figure out how to bring Derek’s new middle form into view. I’d been working with the idea of Derek versing in, looking at his new body, finding his equipment, figuring out how big he was, maybe figuring out how to change his size, and then finding Lauren–and it was all too complicated. This chapter was originally going to be a Brown chapter; I’d even placed the heading on it. I had figured that I would have Bethany do something very complex involving potions and long rituals to enable Derek to change forms; but suddenly I thought it would work best to have Derek first seen through Lauren’s eyes. From that, the thought of the wolves asking her to identify a creature for them appealed. That would happen were he in wolf territory. He was some distance from his things when he versed out, so trying to reach them would be as good a way as any to bring him through the wolf lands. The rest was easy. I really liked the idea of Lauren recognizing Derek as the answer to her prayer. I’d thought of it when I thought of the prayer. I got hung up on the name for a couple hours. I stumbled on Hoffman pretty much the way Lauren does, although I worked with a Mark Hoffman at the radio station. Ferris took a lot longer. I knew a Jeff Ferri in scouts, but didn’t think I could sell that. Ferris is of course the name of the guy who built the amusement park wheel, as well as the character in a movie, Ferris Bueller. I had intended for this section to cover the magic of the transformation, but felt it was bogging down. My concerns at this point are that everyone is a bit slow, and I can’t verse Slade out of his world until I’ve got Lauren caught in combat in hers, and that’s going to be a while, as I have to do the transformation for Derek, cover the stuff about opening the dome, and plan another raid. The vague reference to Pinocchio was an inspiration at that moment, seeming to be appropriate to the magical setting. I took a couple of days to try to piece together what is in essence filler, an effort to move the story forward to the next action scene. I’m still planning on having him go down fighting, although it occurred to me that I can’t really use the efriit battle because in that case the djinn could have come to this world. I’m back to a fight with Acquivar, now thinking that he will take advantage of his status and abuse his honor to get back to the palace, where he will fight Slade. Slade will be clearly superior, but Acquivar’s people will join the fight, and someone will stab him in the back. I decided to do the ritual from Derek’s perspective. It seemed to work best that way. The three forms are each double/half of each other, which is within the ordinary limits established by the game rules. In fact, I’d pushed Derek to be a tall sprite at fifteen inches so that I could get a five foot human with only two doublings. I needed to hurry Slade’s story; I wanted him to enter in a fight. This seemed the best opportunity for a fight. But that meant I had to push forward through Derek’s information that they had to be at the site to open the dome (a decision that was really necessary to make the war against the vampires last more than a few days) to get to them actually doing it. I also needed a credible force that would be too much for the three of them, but not so much that the addition of Slade to the mix wouldn’t balance the odds. I’d established Slade as the better fighter, I thought, so he could more easily take out ghouls with his sword than Lauren could with her martial arts training. This would work, I thought. I needed a setting in which Acquivar might reach the bedroom levels (where Slade’s possessions were) without the alarm having been raised, so that Slade could face him. Having Slade be the last to bed accomplished that. I also needed to make some sense of Acquivar’s presence. I knew pretty much how it was done, but the reader had to get that–and I didn’t see Acquivar stopping to explain. Thus Slade tells it. This led to the idea that Acquivar wasn’t going to say much of anything. At first I’d seen this as a serious fight, but then it occurred to me that it would enhance the battle image of Slade to have him take it very casually for the first few rounds and then, when he got hurt, to finish the game rapidly. I also needed to have him be hit several times in close succession, so that the amount of damage he might take would be reasonably able to kill him. I’d also decided to move him to the next “stage” of versing, where you enter limp but can immediately catch yourself. This would have him in the battle faster than the dream state; and Slade has always been the leader in the versing stages, so that works. I hesitated as to whether to tell this part from Derek or Lauren’s perspective. I went with Derek partly because it was sort of his turn, and partly because he would not know who Slade was. This gave me the ability to describe Slade anew. It had been rattling in my head that there were a dozen ways to get that dome closed that got around the security lockouts on the computer. You could replace the computer with another. You could cut the computer off and apply power directly to the motors. Slade would be the perfect person to know how to sabotage the gear mechanism itself, such that it would require major repairs. The part about destroying the gear was carefully considered; the rest was improvised. I was in part trying to keep the narration flowing reasonably and answer as many problems as I could. The PR problem struck me somewhat out of the blue. My mind has been racing ahead. Tubrok creates a rapid response team to travel to any part of the world in response to an attack. Derek says something about the security being a “tough nut to crack”. Lauren figures out the acorn in time to release Merlin and drive off the attackers. I had two problems. One was I didn’t know where this should happen. The other was that I didn’t want the rest of the book to be one fight after another. Having Slade and Shella enjoy their hotel room seemed a good buffer for that, particularly as this is Shella’s first visit to someplace not medieval. At the same time, I couldn’t make it seem too much like a modern hotel, since this is supposed to be the future, even if in some town of which most people have never heard. Yet I didn’t want to belabor the story with gadgets. The answer was that Slade didn’t understand much of it himself, so I could be specific enough about things that would be recognizable, and vague about things that wouldn’t be. I pondered this section for a couple of days. In that time, I changed it from a Brown chapter to a Hastings chapter. I didn’t want to have to do Derek’s perspective on the security on the computer, and there wasn’t enough to do in front of that to make a preceding chapter. On the other hand, I wanted to be in Lauren’s mind when she made the connection and released Merlin. It was also during this time that I realized I could connect Merlin to Omigger. I was already beginning to sketch this recognition by Shella, which would still be two chapters away. That meant that Derek would describe what Merlin did, the assault which destroyed or drove away vampires, the introductions, and then Shella using the name, and then I’d shift to Slade. The magic object is, of course, an unusual design for a nutcracker. If you saw it next to a bowl of nuts, you’d know what it was in a flash. 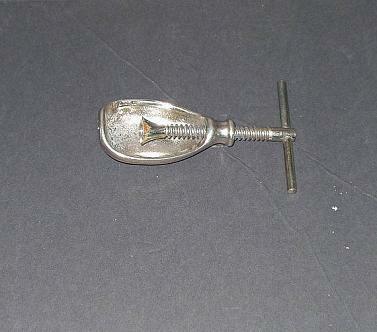 Finding it in a drawer of utensils or a box of tools, it would not be at all obvious. I wanted to emphasize that the situation was desperate; to do this, I backed up a bit and retold the losing battle through Derek’s eyes. This also gave me the opportunity to show Merlin completely from the outside, with no connections to who he might be. I also decided, on the fly, that he shouldn’t kill them all; that was too much power. The others would finish off the last of them. This has been the eleventh behind the writings look at For Better or Verse. Assuming that there is interest, I will continue preparing and posting them every eleven chapters, that is, every three weeks.